Selecting your child’s first school may be one of the most exciting, yet intimidating decisions that you will have to make. Children in quality preschool programs improve their social skills, are better at following directions, waiting turns, problem-solving, participating in activities, collaborating, and relating to other children, teachers and parents. 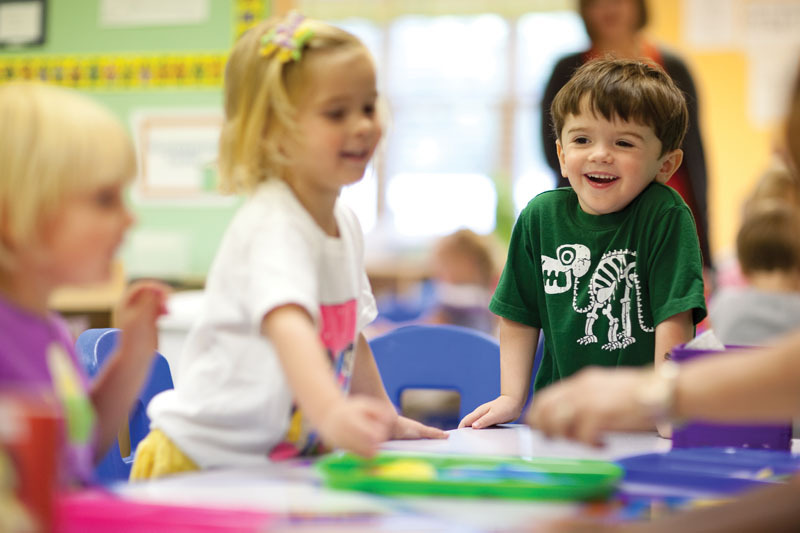 In addition to providing a warm, safe, and nurturing environment, a top quality preschool program should provide a well-rounded experience that helps children become confident, joyful and fully prepared students, while developing a life-long love of learning. There are a variety of teaching philosophies that you will learn about as you research child-care options. Many may seem difficult to apply to a young child where things like safety and security may be your primary concerns. Terms you may hear include: Reggio Emilia approach, Montessori Method, Activity or Play Based Learning, Waldorf approach, and others. The common theme is that all of these methods should focus on children as individuals, getting them enthused about learning, and having them prepared for kindergarten and beyond. Is there a warm and nurturing atmosphere in a physical environment that you can envision your child in? Are there safety and security measures in place that are followed, practiced, and actively reviewed? Are there health and safety standards in place, and what is the “wellness” policy? Does it offer a wide range of enriching activities to meet the individual needs of each child including a focus on building each child’s emotional, social, cognitive and physical skills? What size are the classes and what is the student teacher ratio in the different classrooms? Is the school convenient to your work or home? Happy parents help make happy children. Are there age appropriate outdoor play areas that are maintained in a safe condition? Does it offer multi-cultural and developmentally appropriate materials and equipment, and do you feel a sense of respect for diversity and respect for various cultures? Is there a professional faculty committed to early childhood development, and do they have access to on-going training and continuing education credits? Are the teachers CPR and first aid certified? Can I visit my child any time during the day? Does the school have references available? Do you feel a sense of community among the teachers and parents in the building? Choosing childcare is a very personal decision in which there are no right or wrong answers. Do your best though to ask the right questions. Children have a natural curiosity in STEAM subjects (science, technology, engineering, arts and mathematics). You can encourage your little scientist’s interests by conducting the following easy experiments at home. Milk Fireworks: Pour whole milk into a baking pan. Add drops of red and blue food coloring. Add a “squirt” or two of dishwashing liquid, and watch the colors burst and swirl! When the “fireworks” slow down, add another couple of drops of dishwashing liquid to get them going again. Explanation: The soap separates the fat from the other liquids in the milk, causing patterns to appear. Dancing Raisins: Put raisins (or dried corn or macaroni) in a clear cup. Fill the cup with lemon-lime soda. Watch how the raisins bob and sink in the cup. Ask your child what makes the raisins do this. Explanation: The gas bubbles in the soda lift each raisin up, and when the bubbles reach the surface and pop, the raisins sink. Salt & Vinegar Pennies: Put ¼ cup of white vinegar into a clear plastic or glass bowl. Add one teaspoon of table salt and stir until the salt dissolves. Dip a dull, dirty penny halfway into the liquid, holding it there for 10 to 20 seconds. Remove the penny from the liquid. What does your child see? Explanation: Salt and vinegar create a weak acid that dissolves copper oxide, which is the tarnish on a dull penny. Winter is here, and that means it’s time to make some snowballs! Not everybody gets snow but that’s okay because this craft can be done anywhere. It’s really easy and, more importantly, really fun! Brush Styrofoam balls with a thin coating of glue. Cover each ball with the squares of tissue paper (the more crinkly, the better!). While still sticky with glue, coat each ball with glitter. You can add wire or string to hang your snowless snowballs on display or glue them together to make a fun sculpture. Encourage your little ones to let their imaginations run wild!